What are the clinical implications if an appendix cannot be visualized in the MRI scans of a pregnant patient presenting with symptoms of appendicitis? As long as the MRI exam performed was of adequate diagnostic quality, appendicitis can probably be ruled out, findings from a study published online in Abdominal Radiology suggest. MRI has a high level of sensitivity in diagnosing acute appendicitis. However, with pregnant patients, radiologists may not be able to confidently visualize the appendix due to patient or fetal motion, increased vascularity, and/or anatomic alterations from an enlarging uterus with crowding of viscera. The difficulty of diagnosing pregnant patients is one of the reasons that pregnant women experience a higher incidence of perforated appendicitis than the general population. It is estimated that up to 25% of these women may lose their fetus as a result. Radiologists at William Beaumont School of Medicine in Royal Oak, MI, conducted a retrospective study to determine the clinical implications of appendix nonvisualization of pregnant women who had a MRI to rule out appendicitis. They analyzed 58 cases of 57 consecutive patients who had MRI exams at an academic hospital (37 exams) and two affiliated community hospitals (21 exams) from March 2014 through August 2015. Figure 1. 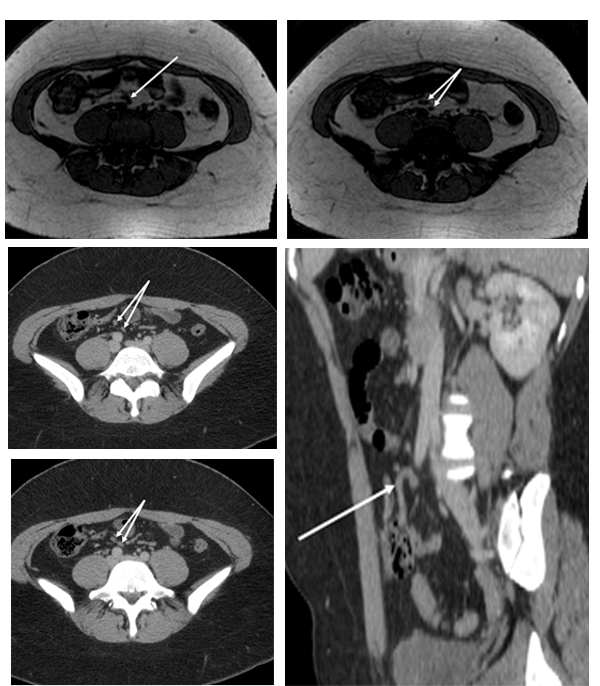 Axial T1, opposed-phase images show a blind-ending tubular structure in pelvis which was correctly identified as a normal appendix by two of the three reviewers (arrows). This could easily be confused with a tortuous mesenteric vessel if the blind-ending nature is not appreciated. Axial and oblique sagittal CT images from a CT performed prior to pregnancy for an unrelated reason confirms the retrocecal location of the appendix which loops upon itself (arrows). Three abdominal radiologists independently reviewed the exams for diagnostic quality, visualization of the appendix, presence of appendicitis, and alternate diagnoses. The appendix was considered visualized only if all three radiologists were confident they had identified it. Similarly, all radiologists needed to concur that the images from a MRI were of diagnostic quality to categorize an exam as adequate. Fifty of the cases, or 86%, were of diagnostic quality. Of the eight cases that were not, all were performed at the community hospitals. Radiologists were able to visualize the appendix in half of the 50 cases, and diagnosed six patients with acute appendicitis. Lead author Sayl Al-Katib, MD, and colleagues in the department of diagnostic radiology and molecular imaging, reported that none of the patients represented cases where at least one of the radiologists could not visualize the appendix had a final diagnosis of appendicitis. The results of the study confirmed that appendicitis visualization is strongly related to the diagnostic adequacy of MR-acquired images. At the academic hospital, a radiologist was on site to protocol each body MR exam and to verify quality of acquired images. This was not the case at the community hospitals. The authors recommend that the MRI protocol used in order to reduce the effect of motion artifact should be optimized for each patient, and that on-site quality assurance by a radiologist could guarantee that the MRI technique used would produce the best possible diagnostic quality images. They noted that issues with MRI technique was a contributing factor in 63% of the exams in their study considered to be of inadequate quality. Al-Katib S, Sokhandon F, Farah M. MRI for appendicitis in pregnancy: is seeing believing? clinical outcomes in cases of appendix nonvisualization. Abdom Radiol. Published online August 10, 2016. doi: 10.1007/s00261-016-0864-y. Clinical implications of non-visualization of appendix of pregnant women with appendicitis symptoms. Appl Radiol.